Corine de Farme Baby Fresh & Natural Wipes - Set of 62 | Multicolour | Alcohol Free. 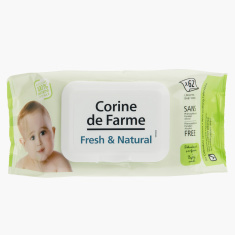 Consisting of sixty wipes, these will gently cleanse your baby's sensitive skin whilst moisturizing it. It is made from natural ingredients making it be alcohol-free and is tested for allergies. Feature 2 : hypoallergenic. Made of natural ingredients.